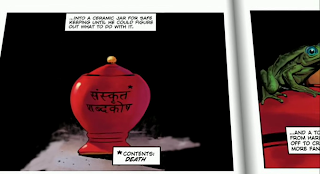 The No Good Blog: Death Is A Sanskrit Dictionary? That's hilarious! Both the Dictionary Death Jar and the WMplayer. I saw Ironman and the terrorists speak a sort of urdu/hindi mixture in that; and they got the subtitles totally wrong in that too. LOL! That is very amusing indeed! NGAC (hugs) boy! Am I glad to see you again!! @Mona: Aw shucks :) But I'm glad to be back too! @The Weaver: Haha! Quite probable!